Note: Assad Sauma Assad considers patriarch Afrem Barsom, Naum Faiq and Bishop Dolabani, because of their Assyrian nationalism, as uneducated minors. Photo montage. The notorious anti-Assyrian Assad Sauma Assad, in his book about the Syriac Orthodox Patriarch Afrem Barsom from 2007, tries glossing over the Patriarch's pro-Assyrian statements from 1920s. He claims Barsoms historical knowledge had not matured before he was 60. Only then he would have realized that the name Assyrian was wrong and repented. The same applies to Syriac Orthodox Bishop Yuhanon Dolabani and Naum Faiq, claims Assad. Thus Assad explains these personalities as incompetent and insults them, journalist Augin Kurt Haninke writes. He also publishes a unique document here, that once again is proving Afrem Barsom’s Assyrian patriotism when he was bishop. If patriarch Barsom had been alive, he would certainly have no objection against Assad's historical revisionism, because he himself switched after he became Patriarch in 1933. But Dolabani remained true to his ideals throughout his life, even though he was banned to acquaint himself with the Assyrian national issues by two patriarchs - Elias Shaker and Afrem Barsom. It is also ridiculous when Assad, under the pseudonym of "Bar Daysan", states in his own journal Aram (1998) and Bahro Suryoyo (1999) that Naum Faiq would have nothing to do with Assyrian nationalism. Such a blatant foul should be foreign to a person who wants to give the impression of being a serious scholar. Assad holds a PhD on Bar-Hebraeus book Awsar roze (Chamber of Secrets) and signs the book of Patriarch Barsom with "Doctor of Semitic languages​​/Syriology". Later in this text we will examine his assertion about Naum Faiq by going back to the original source. The new document that we now present here for the first time is a letter that Elias T Palakh (son to Naum Faiq’s brother Tuma) wrote to Bishop Dolabani in Mardin in April 1953. He wondered why the patriarch Afrem Barsom had now become a hater of the name Assyrian. 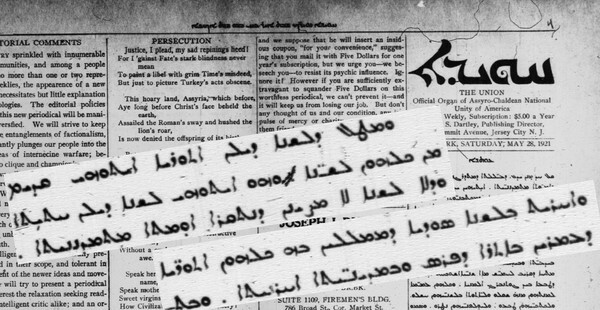 It was he who, during his visit to the U.S. in 1928, had been proud of his Assyrian heritage, writes Palakh and also quotes a poem by Bishop Barsom. The poem's first verse starts with: Ahe rhime Oromoye, Genso shbiho d Othuroye, which means "My dear Aramean brothers, of the noble Assyrian race". (The entire poem can be found at the end of the text). The reason for the letter was that a conflict had blown up between the Jacobite Assyrians in the United States and their church leadership. A few months earlier, in December 1952, patriarch Afrem Barsom had signed a decree to his representative in the United States, Bishop Yeshu Samuel, and ordered him to change the name Assyrian Church of the three churches he himself had inaugurated 1927-28 to Syrian Church. Assad writes that the bishop had consecrated these churches and also indicates the exact date for each one, but avoids saying that it was under the name of Assyrian Apostolic Church. It's his way to conceal the truth, same way as he writes that Bishop Barsom had "defended the Syrian’s rights" at the Paris Peace Conference 1919-20. We know that Bishop Barsom used the phrase "our ancient Assyrian Nation" about his people's origin in his memorandum dated February 1920. But Assad doesn’t mention that part of the matter. The term Syrian is an abbreviation of the Assyrian, but that is not either of interest for Assad. For him only the term Aramean is of interest. 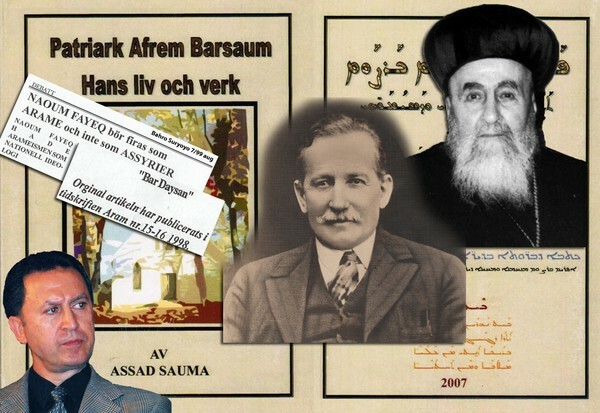 Assad wrote his book about the patriarch Barsom in 2007 (in Swedish) when it had been 50 years since the Patriarch passed away. On the back he records a verse from the patriarch's poems that begins with "Beth-Nahrin d Oromoye, athro rġiġo d Suryoye" (Mesopotamia of the Arameans, the beloved country of the Syriacs). The entire poem consists of 48 verse lines where the word Arameans occurs only twice in the middle. Assad picks up that particular piece and put it on the cover of the book. This piece is also used extensively in various anti-Assyrian sites for the same purpose. It has also become a song that Assad's brother Ninos Assad has composed and voiced by the church choir in Stockholm, under Ninos’ management, broadcasted on Suryoyo Sat in 2009. "The speakers mentioned my name and our Assyrian people's names repeatedly //…//Lord Curzon emphasized in his reply on 12 and 17 March, expressed with great respect, that the peace conference would take up the Assyrian issue in more detail when the time came//…//Also, I received a letter from the Prime Minister on February 7, in which he stated that his government greatly intend interest in the Assyrian peoples cause//…//We have argued for our demands, although we are not known in the European press and among the West's politicians. We have taken their eyes to the noble Assyrian race." The most interesting thing is that Bishop Barsom wrote this letter in English, while Naum Faiq translated it to Arabic and published it in his magazine Bethnahrin with Assyrian letters. Note: The article in Bahro Suryoyo 1999, signed "Bar Daysan" but most likely written by Assad Assad, who had previously published Murad Cheqqe’s article in his magazine Aram 1998. Assad himself has never seen the original article of Huyodo 1921, but bases his claims on Cheqqe’s book Naum Faiq - zekra wa takhlid from 1936. Elias T Palakhs letter to Dolabani refers to Bishop Barsoms own words in kthobonoyo where he is proud of his Assyrian heritage. But according to Assad the reason that Afrem Barsom and Yuhanon Dolabani saw themselves as Assyrians was that they were uneducated of their history, until one day they matured and realized their mistake. Naum Faiq himself was, according to anti-Assyrians like Assad, ​​an Aramean, lacking any connection to an Assyrian heritage. 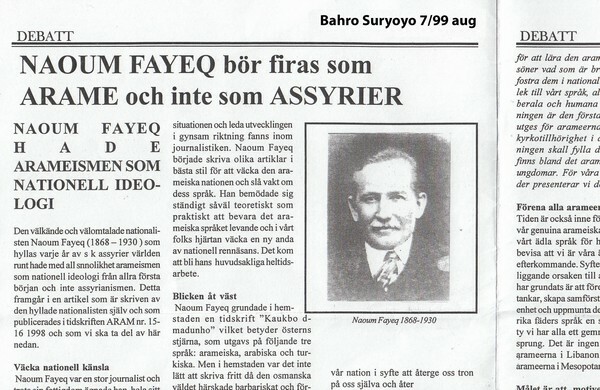 We find this statement in an article in Bahro Suryoyo, which is the magazine of the anti-Assyrian federation Syrianska Riksförbundet in Sweden, entitled "Naoum Fayeq must be celebrated as Aramean, and not as Assyrian" followed by the subtitle "Naoum Fayeq had the Arameism as national ideology”. This article is signed "Bar Daysan" and is based on an article by Naum Faiq in Huyodo 1921 in Arabic, which has been translated into Swedish and published in the magazine Aram 1998, where Assad was the publisher. Assad masters Arabic very well and may be seen as the foremost candidate among possible individuals who translated Faiqs article, and later entered the debate article under the same signature “Bar Daysan”. Assads source of the article is Murad Cheqqe’s commemoration book of Naum Faiq from 1936 named Naum Faiq - Zekra wa Takhlid. I have previously in my article Murad Cheqqe corrupted the poems of Naum Faiq (2011) shown that Cheqqe had distorted Naum Faiq’s poems and removed some pro-Assyrian pieces. I was able to do that since I had access to a booklet with Naum Faiqs own handwriting which contained the relevant poems in its original. Thanks to Modern Assyrian Research Archive, MARA's great work we are no longer dependent on secondary sources. Note: The first issue of the weekly magazine Huyodo of May 1921. First page entitled "to the honour of Assyria" above the image of Agha Petrus. Even this time I have gone back to the main source for Assad and Cheqqe, namely the magazine Huyodo’s first issue in May 1921 in the archives of MARA. 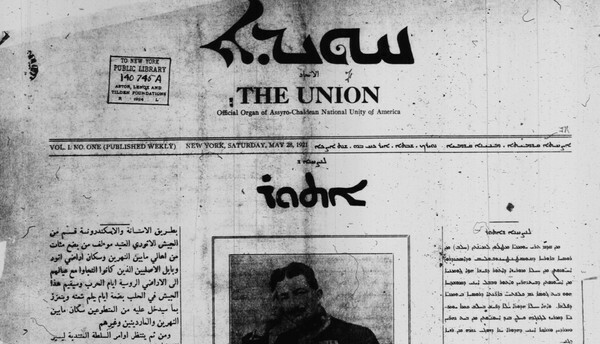 Huyodo was published in New York by the Assyro-Chaldean National Unity of America (in Assyrian Shawtofutho umthonoyto othuroyto-kaldoyto) between 1921 and 1922 weekly. After 39 numbers it was closed down. Naum Faiq (Naom Elias Palak) was the chief editor, assisted by Samuel A. Jacobs. Other editorial staff was IB Moorhatch, John Ashjy, Sanharib Bali, Joseph J Durna and Henry Durna (advertising manager). Publisher was Charles S. Dartley. The first issue gave full attention to the importance of an independent Assyrian journalism and has the headline "To the glory of Assyria" followed by General Agha Petrus image. Huyodo was published in different languages​​; kthobonoyo Assyrian and East Assyrian spoken language [swadaya], Turkish with Assyrian letters, Arabic with Arabic letters and in English. What differed Huyodo from previous Bethnahrin (1916-20) was that they were now using printed fonts in all languages. They no longer wrote by hand. 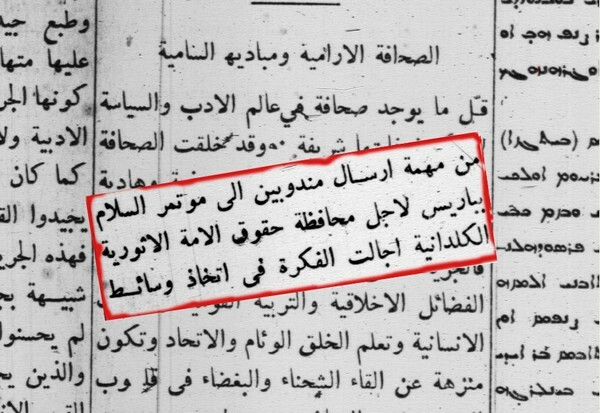 Note: Here is the original of Assad's source of "The Aramean journalism" in Huyodo 1921. The article mentions "the Aramean nation" frequently, but a few lines further down "the Assyro-Chaldean nation" is mentioned as well. What Assad relies on in this issue of Huyodo is an article in Arabic under the title As-sohafa al aramiya wa mabadiha as-samiya (the Aramean journalism and its high principles). The article is not signed by any author, but attributed to Naum Faiq by Assad and Cheqqe. There, we find, quite correctly, al-umma al-aramiya (the Aramean nation) all over the article, but a little further down in the same article it says that Assyro-Chaldean National Unity of America had sent two delegates to the Paris conference "to defend the Assyro-Chaldean nation”. In the preface in kthobonoyo it is written about the choice of the magazine's name, and the importance of developing the language, here called "leshono othuroyo" (Assyrian language). Further down it says that Huyodo even uses the Assyrian colloquial “swadaya spoken by all Assyrians (Othuroye) in Persia and other cities”. Note: In the Assyrian preface Naum Faiq calls the language "leshono othuroyo". What Assad and his supporters among the anti-Assyrians do is to pick a singel quote where Naum Faiq mentions the word Aramean and leave out all the articles and poems in which he calls for an awakening to free Assyria. The most famous of his poems is Ett’ir bar Othur ett’ir (Awake, son of Assyria!). Anti-Assyrian’s approach is thus to lift up only half the truth. That way they think they can fool their audience. But the truth comes out sooner or later. The past often catches up and reveals their revisionism of history. Assad's behaviour is reminiscent of that which Bengt Knutsson, associate professor of Semitic languages ​​at Lund University, Sweden, did in 1982 when he wrote a report called Assur or Aram (published by Swedish Immigration Board and the Board of Culture). There, he was confirmed by Bishop Aphram Abboudi in Sweden that he had said to be of Assyrian origin during a visit to Södertälje in 1969. But Knutsson then did his utmost to explain the bishop's flip as a result of ignorance. Abboudi was also a learned monk when he preached his famous statement that was recorded on tape. Knutsson argue that it can be excused because Abboudi partly acknowledges bluntly, and was ignorant of his history at the time. This is what the writers who have a political agenda are doing. If we return to the turmoil among the Assyrians in the United States in 1953, it was because patriarch Barsom had decided that the three churches under the name Assyrian Church must change their name to Syrian Church. Bishop Yeshu Samuel had as recently as August 1952 written a letter to his congregation representing the Assyrian Orthodox Archdiocese and said: "I shall need the cooperation of every Assyrian who has the love of his church and nation in his heart”. But now the church leadership turned against the Assyrian national movement and intensified its opposition to any kind of Assyrian patriotism. The new Arab states, Iraq and Syria would not accept any "Assyrian separatism" according to the church's point of view. A personal circumstance may be that the patriarch Barsoms large family still lived in Iraq. He had seven brothers and sisters, of whom the youngest, the doctor Abdalla Barsom, had made ​​a career in the Arab Iraq as Secretary General at the Department of Health, according to Assad. Patriarch Barsom now began to distance himself from anything that was called Assyrian and wrote in 1953 a book on the history of the church, where he says that the name of the Church has always been Syrian in English and gives India as examples. As early as 1947, he had in a decree urged his congregation to reject the Nestorians since Nestorius was still excommunicated (since the year 431 at the Council of Ephesus). He was also in the process of excommunicating his Nestorian colleague in the 1950s. The term Assyrian was for patriarch Barsom now equated with Nestorian. He claimed that the Assyrian name was an English creation to the Nestorians, in order to use them in their imperial ambitions in Iraq. He was referring to the Assyrian Levies. “I am further informed that the Chaldean Patriarch Emanuel and the Jacobite Bishop Mar Athanaseus [Tuma Qassir] have signed a telegram addressed to His Majesty King Feisal thanking His Majesty and the army, and stating that the country is now quite peaceful. I gather they were afraid to refuse to sign the telegram, which was drafted for them by the Iraqi authorities”. The fact that these church leaders felt scared after the barbaric mass murder in Simele, was no exaggeration from the British consul's side. It could also affect their own congregations. But we should not forget that these two belonged to rival sister churches. This means that the Chaldean patriarch may well have been pleased that the "rebel" Nestorian Assyrians were expelled and their women and children murdered. The same applies to the Syrian Orthodox Bishop Tuma Qassir which most likely had been instructed by patriarch Afrem Barsom to show loyalty to the Iraqi regime. About one month after the Simele massacre King Faisal died. In a letter to monk Yeshu [Samuel] in Jerusalem patriarch Barsom orders him to publish two entire pages about the biography of the king, expressing that he was merciful and a great friend of the Christians. The patriarch himself was born and raised in Mosul but had his residence in the city of Homs in Syria, which was still a French mandate. He had begun to cooperate with the Arab nationalists to drive France out of Syria. He was also an old friend of Faisal before he become the king of Iraq. They both patricipated in Paris Peace Conference in a joint effort for the rights of the Arabs, according to the biography of Afrem Barsom Nafahat al-Khuzam (1959). As for the ethnic identity, patriarch Barsom began highlighting the name Aramean as an alternative to Assyrian, since Arameans had no political claim in Arab rulers’ eyes, because no movement or organization among our people had ever demanded an Aramean territory. However bishop Barsom 1920 hoped for a "free Assyria for a century-old dream" in his correspondence from London and Paris with Assyrians in USA. The result of this stance is well known. Name conflict among our people, increased in intensity after our emigration to the West (where Assyrian national movement became more active). We suffer today, as a result of Patriarch Barsom’s behaviour, when our kids get into deep discussions about what he said or didn’t say, about this or that denomination. The situation worsened after the Arab Baath regimes backed the Aramean designation to create division among the Assyrian people, in order to destroy the Assyrian national movement. Different regimes in the Middle East even today utilize anti-Assyrians to make the conflict even deeper. Assad's reasoning that patriarch Barsom’s historical knowledge matured when he was 60 does not hold. In his book about Patriarch Barsom, Assad writes in the preface that the Patriarch was the most educated church leader and author in the Syrian Orthodox Church during the last 700 years. He is said to have studied history and philosophy at an early age in Zafaran monastery in Mardin, Jerusalem and Paris. Assad also writes the following about Afrem Barsoms commitment when he was a 21-year-old monk in Zafaran monastery: "In 1908, when the Syrians in Amed [Diyarbakir] founded the association Awakening [Intibah] the monk Afrem Barsaum was an active member of the Association and worked to encourage all interested parties to renew and publish the old Syriac culture. He wrote nationalist songs on both Syriac and Turkish on this Association”. But Assad carefully avoids mentioning that Naum Faiq and his friends were behind the founding of the Intibah association and they published a magazine with same name. Similarly, he avoids mentioning that it was about Assyrian nationalism. Afrem Barsom corresponded with his good friend Naum Faiq for three decades until Faiqs death in 1930. Naum Faiq covered the peace conferences in the 1920s in his magazine Bethnahrin, where we find several articles about or letters of Bishop Barsom, such as the letter in April 1920 as mentioned above, written in the port city of Marseille when the bishop was on his way to Beiruth. It was also published in Izgadda in its English original. Afrem Barsom was well educated and managed seven languages. He made three big tours in the Middle East, Europe and the United States (1913, 1919 and 1927) searching for ancient manuscripts, which he read and catalogued. He visited all the major libraries and museums in London, Paris, Berlin, Florence, Chicago and others. The result was the book al-lu'lu al-manthur (1943) which Bishop Dolabani translated from Arabic (1967) to Syriac. It received the title Berule bdhire (scattered pearls). Is it possible that Afrem Barsom had a strong Assyrian national sentiment based on ignorance? Obviously, he was not ignorant of his ancient Assyrian history and his roots, but we know he later switched sides and has inspired anti-Assyrian revisionists like Assad. Here is the stature of victory and pride. grave into the bosom of Assyria. this courageous Mar Shemun is in the grave. as it will witness the salvation of Assyria our mother (nation). let them decorate all around my grave in places of liberty and pride. "Having viewed the fruits of the nation's effort generated in a short time, I feel myself start to send this good news to the sons of the Assyrian nation and tell them about my joys and hoping to share them with you. The city of Adana, which at the time of Shalmanasar III trembled with fear of the Assyrian armies, has in recent times become a haven for their poor". "There [in Adana] people gather from all directions and the city is most similar to ancient Babylon, given the diversity of languages. The Assyrians are now in a deep frustration at the prospect of this state will remain. They regard the national language as the nation's lifeblood. If the rising generation does not learn it, you can say goodbye to the Aramean people [in the Assyrian original this phrase doesn’t exist at all]. They can not accept that their children will be without the upbringing and education but remain refugees and strangers, ignorant of the language of their nation. They want an improvement. The first thing they have done is to open an elementary school, where they teach [classical] Syriac and Turkish// ...// I can mention what some people say when students on Sundays are seen walking around the streets of Adana. Some say that those people have woken up, and others that they are Assyrian orphans. They are Assyrians [Athuriler]"
"Many promises of help have been given by Bishop Afrem Barsom, Dr. A.K Yusuf and the local [French] authorities. But the goal is not achieved with promises//...//We need more resources//...//I have targeted associations, societies and all the Assyrians eyes on this duty and this new building, over which the Assyrian name shines, until it becomes fully restored in teaching and learning”. The quotes and the poem above contradict what Assad claims about Dolabani, who never renounced his Assyrian patriotism later in his life. Dolabani acted throughout his life for the unity between the various Assyrian churches - unlike patriarch Barsom that created divisions and used the weapon of excommunication lightly. He excommunicated Farid Nazha in 1934, and also threatened to excommunicate his Patriarchal colleague of the Church of the East [now Assyrian Church of the East] because he followed Nestorius. About Afrem Barsom we can say that he later in his life changed his opinion and ideology and opposed the Assyrian national movement on all levels. Dolabani however, was obliged by his superiors the patriarchs to stop teaching Assyrian nationalism to his students, but remained faithful to his old ideals. Read more in my article Dolabani was forbidden to teach Assyrian patriotism. Also read my article: The patriarch who switched sides (Swedish in Hujåda magazine). Note: A unique document: a letter from Elias T Palakh to bishop Dolabani in April 1953, who wonders why patriarch Afrem Barsom has become a hater of the name Assyrian, when he in 1928 was proud of his Assyrian heritage. 1928 senesinde kasıd resuli sıfatıyla Amerika’yı ziyaret eden patrikimiz haflelerde içtima’larda yazdığı neşideyi umume söyler. Bugün o isimden ikrahi bilmem nasıl ta’rif edeyim, neşideyi sureti Beth-Nahrin at ithayk mothan makamı üzerindedir. ’Af ederseniz, zatınızı rencide etmek fikriyle bu yazıları yazmıyorum, ancak bu hastalıklara şafi ilaçlarınızdan istifade etmek kasdıyla yazıyorum. Ma’ ıl ‘ayle [ailece] ellerinizi öper ad’iya mabrürenizi iltimas eyleriz, barekhmor. "How should we respond to these? and our Assyrian kings, and our scholarship in Edessa. whose fame riches all the nations in schooling and enlightenment. I apologize if I'm bothering you. That's not why I write. My intention is to find a cure for this sick situation. The whole family kiss your hand and ask for your valuable prayers for our protection. Barekhmor! According to the late Assyrian author Abrohom Gabriel Sawme, Dolabani had answered the US-Assyrians inquiry and said that the only adequate name in English for both the people and the church was Assyrian. Sawme tells that in an interview from 1994. It can be seen on Assyria TV. Assad, Sauma Assad: Patriark Afrem Barsaum – hans liv och verk, p 19-20, Stockholm 2007. Ibid, p 46 including note no.2. Bahro Suryoyo No. 7, August 1999. Assad, Sauma Assad: Patriark Afrem Barsaum – hans liv och verk, p 12. Egrotho Kumroyotho, compilation of patriarchal letters, p 328, Jerusalem 2010, Gothenburg 2011. The reason was that he was banned from entering Turkey, hence he couldn’t occupy the Patriarchal See in Mardin, Turkey. Assad, Sauma Assad: Patriark Afrem Barsaum – hans liv och verk, p 15. These quotes are translated from the Arabic version of Bethnahrin. We do not know if Dolabani wrote the letter in Arabic as well or if it is a translation.